S’ip Joyfully. From the creators of S’well, S’ip is playfully designed to bring charm and fun to your everyday water bottle, perfect for when you want to let your fun personality shine through. Whether it’s ice-cold water, fresh juice, or a steaming cup of hot cocoa, S’ip will keep your beverages hot or cold all day long. The S’ip water bottle lets you quench your thirst from dusk till dawn. Using authentic S’well technology, their 15oz vessel will keep beverages cold and hot longer than your average bottle. S’ip is made from double-walled food grade 304 18/8 stainless steel, and fully tested for healthy hydration. Your S’ip bottle is your everyday hydration companion that shows what’s on the inside… on the outside. 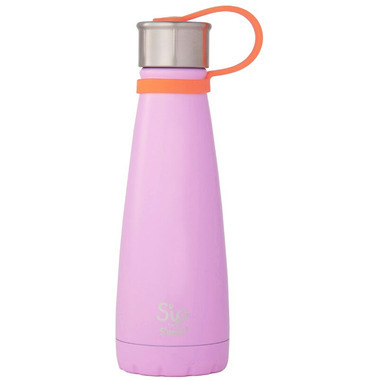 The patterns and colours are playfully designed to keep you sipping in style, with a S’ip bottle to match any mood, personality, outfit or activity. Think outside the bottle. They have an array of designs that express your originality. No need to choose just one, there’s a S’ip for every whim. So sip from a S’ip that shows off your true colours. Iâ€™d give this more like 3.5 stars. The water bottle itself is good just like any Sâ€™well bottle in terms of keeping the liquid cold. My problem with this is that the lid is actually a little tricky to get off because of the lid strap...which is is what I purchased this bottle for. I bought it for my daughter thinking that the lid strap would prevent the lid from getting lost, but it actually makes it difficult for her to open. Also, it makes the most annoying chirping sound as the lid is being unscrewed. So...yay for the bottle and nay for the lid strap.